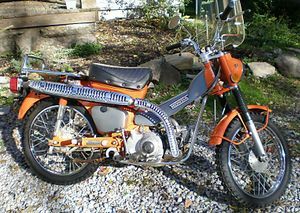 The Honda CT-90 was a 90cc 4-stroke OHC dual-purpose motorcycle made by Honda from 1966 through 1979 using styling cues from its smaller brother, the Honda C105T. 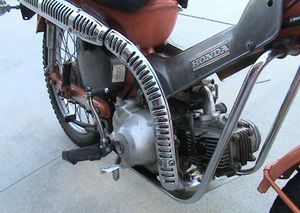 It had a unique step-through design which remained during the run of the motorcycle. The seat accomodated one person and it came equipped with a generous storage rack behind the seat. It is perhaps one of Honda's hidden success stories, this bike sold well worldwide and has a faithful following to this day. 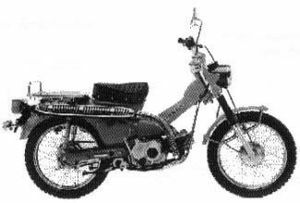 The Honda Trail 90 CT90K0 was sold 1966-68. Two colors were available: Scarlet Red and Yellow. The exhaust was up-swept. The exhaust system and heat shield were chrome. The seat was a solo seat with chrome trim. 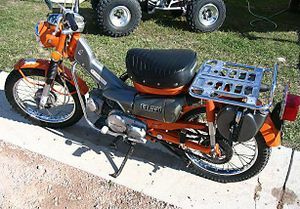 The chrome luggage rack behind the seat was standard equipment. 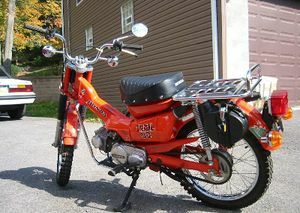 The fuel tank decal reads "HONDA 90". 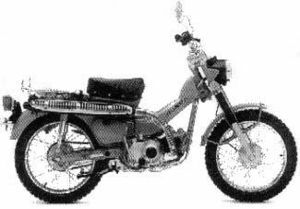 The early 4-speed model had a dual overlay rear sprocket setup. 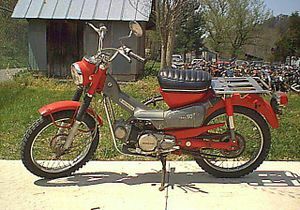 The later models had a single sprocket but an 8-speed dual range transmission. 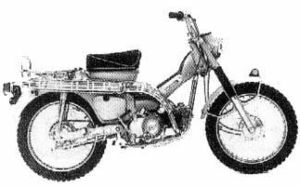 The front suspension used a bottom link rather than telescopic fork tubes. 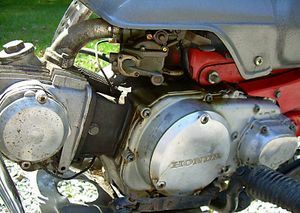 The engine was improved to a 89cc OHC single cylinder with an automatic clutch. The serial number began CT90-100001. The Honda Trail 90 CT90K1 was sold 1969. Two colors were available: Scarlet Red and Yellow. They were accented with a gray plastic shroud. The exhaust system and heat shield were chrome. The seat was a solo seat with chrome trim. 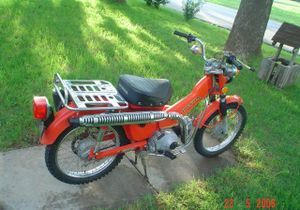 The chrome luggage rack behind the seat was standard equipment. 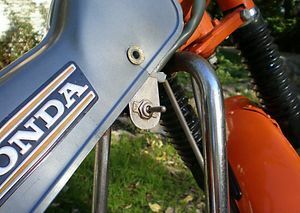 The fuel tank had no decal, but the down tube reads "HONDA". The transmission was an 8-speed dual range. The front suspension used telescopic fork tubes. 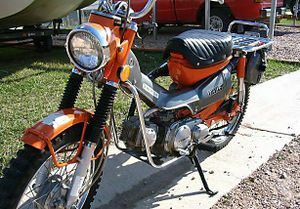 The engine was a 89cc OHC single cylinder with an automatic clutch. The serial number began CT90-200001. 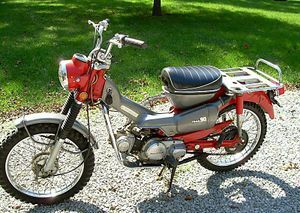 The Honda Trail 90 CT90K3 was sold 1971. Two colors were available: Scarlet Red and Summer Yellow. They were accented with a dark gray metallic plastic shroud. The side covers were also gray. The frame shroud had a vertical black stripe. The handlebars had a swivel lock. The exhaust system was black and the heat shield were chrome. The seat was a solo seat with chrome trim. 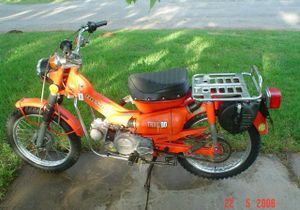 The chrome luggage rack behind the seat was standard equipment. 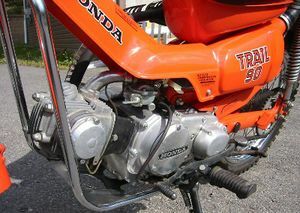 The fuel tank had no decal, but the down tube reads "HONDA". 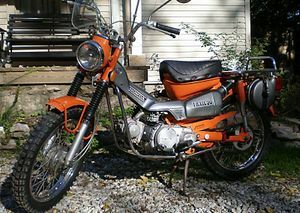 The transmission was an 8-speed dual range. 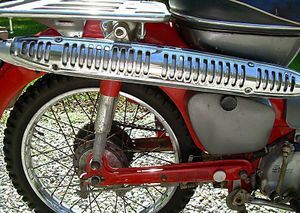 The front suspension used telescopic fork tubes. 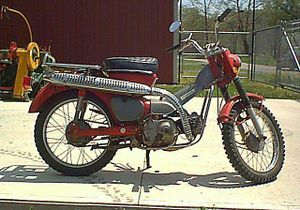 The engine was a 89cc OHC single cylinder with an automatic clutch. The serial number began CT90-400001. 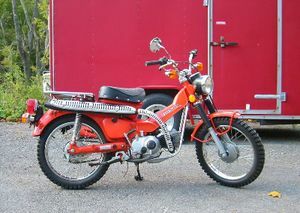 The Honda Trail 90 CT90K4 was sold 1972-73. One color was available: Mars Orange. It was accented with a dark gray metallic plastic shroud. The side covers were also gray. The frame shroud lost its vertical black stripe. The handlebars had a swivel lock. The exhaust system was black and the heat shield were chrome. The seat was a solo seat with chrome rivets. 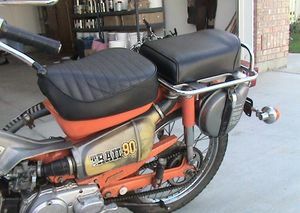 The chrome luggage rack behind the seat was standard equipment. 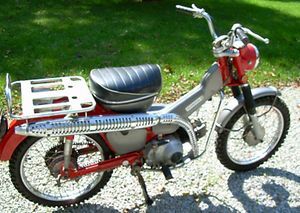 The fuel tank had no decal, but the down tube reads "HONDA". An auxiliary fuel tank was mounted on the left side of the rack. The transmission was an 8-speed dual range. The front suspension used telescopic fork tubes. 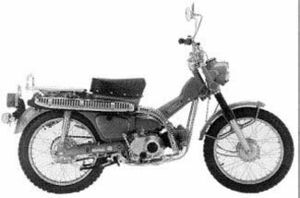 The engine was a 89cc OHC single cylinder with an automatic clutch. The serial number began CT90-1400001. 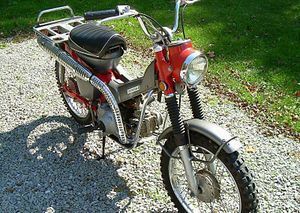 The Honda Trail 90 CT90K5 was sold 1974. One color was available: Mars Orange. It was accented with a dark gray metallic plastic shroud. The side covers were also gray. The handlebars had a swivel lock. The exhaust system was black and the heat shield were chrome. The seat was a solo seat with chrome rivets. 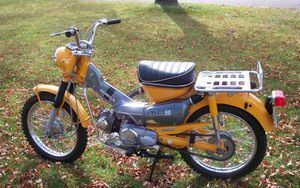 The chrome luggage rack behind the seat was standard equipment. 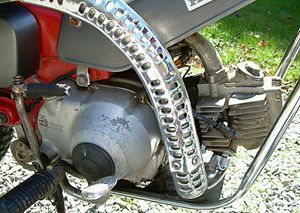 The turn signal housings were chrome. 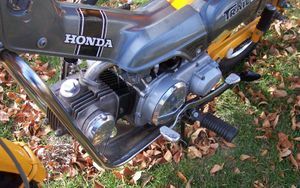 The fuel tank had no decal, but the down tube reads "HONDA". An auxiliary fuel tank was mounted on the left side of the rack. The transmission was an 8-speed dual range. 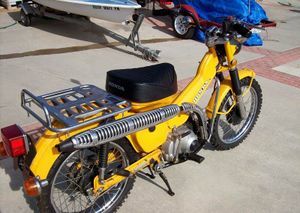 The front suspension used telescopic fork tubes. 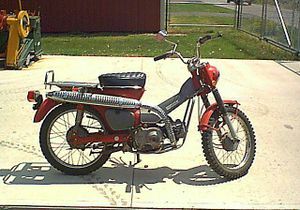 The engine was a 89cc OHC single cylinder with an automatic clutch. The serial number began CT90-1500003. 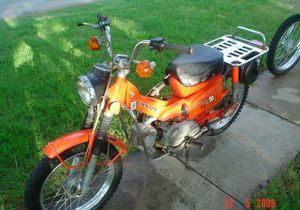 The Honda Trail 90 CT90K6 was sold 1975. One color was available: Tahitian Red. The frame shroud and side covers were the same as the body color. The "HONDA" decal on the shroud was black. The handlebars had a swivel lock. The exhaust system was black and the heat shield were chrome. The seat was a solo seat with chrome rivets. The chrome luggage rack behind the seat was standard equipment. The turn signal housings were chrome. An auxiliary fuel tank was mounted on the left side of the rack. The transmission was an 8-speed dual range. 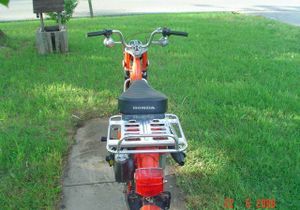 The front suspension used telescopic fork tubes. 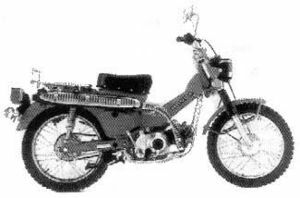 The engine was a 89cc OHC single cylinder with an automatic clutch. The serial number began CT90-1600003. 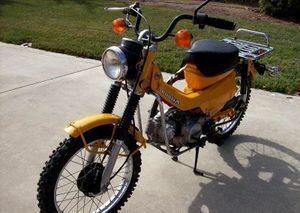 The Honda Trail 90 CT90'76 was sold 1976. One color was available: Shiny Orange. The frame shroud and side covers were the same as the body color. 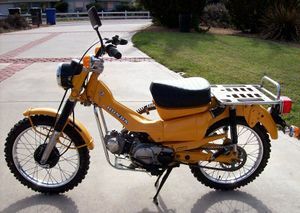 The "HONDA" decal on the shroud was yellow. The handlebars had a swivel lock. The exhaust system was black and the heat shield were chrome. 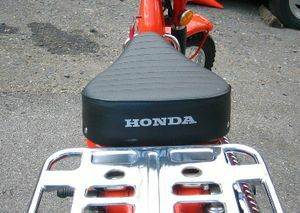 The seat was a solo seat with chrome rivets. 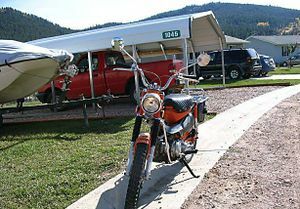 The chrome luggage rack behind the seat was standard equipment. 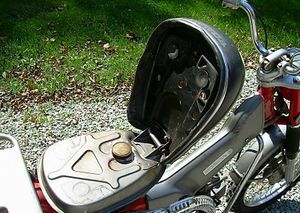 The turn signal housings were chrome. An auxiliary fuel tank was mounted on the left side of the rack. The rear shock springs were chrome and they also had external springs. The transmission was an 8-speed dual range. 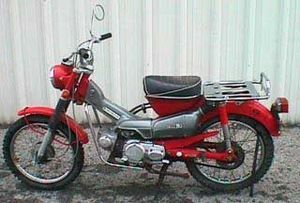 The front suspension used telescopic fork tubes. 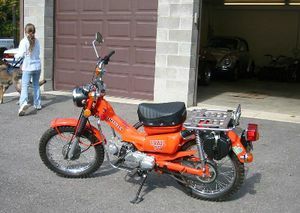 The engine was a 89cc OHC single cylinder with an automatic clutch. The serial number began CT90-1700004. 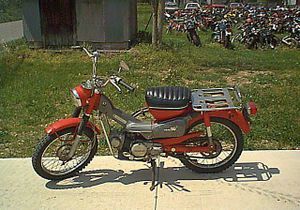 The Honda Trail 90 CT90'77 was sold 1977. One color was available: Shiny Orange. The frame shroud and side covers were the same as the body color. The "HONDA" decal on the shroud was black. 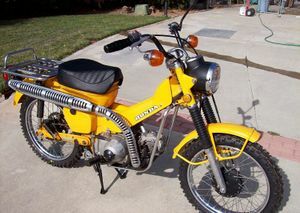 The handlebars had a swivel lock. The exhaust system was black and the heat shield were chrome. The seat was a solo seat with chrome rivets. 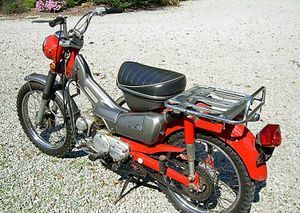 The chrome luggage rack behind the seat was standard equipment. 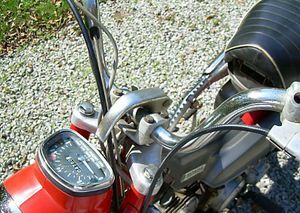 The turn signal housings were chrome. An auxiliary fuel tank was mounted on the left side of the rack. 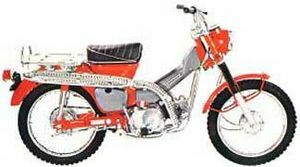 The rear shock now had external springs and they were chrome. 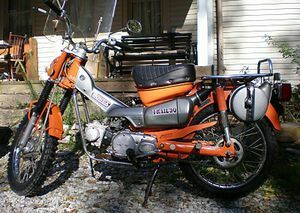 The transmission was an 8-speed dual range. The front suspension used telescopic fork tubes. 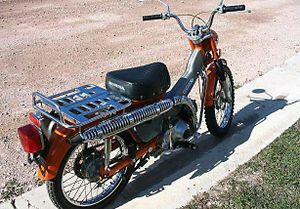 The engine was a 89cc OHC single cylinder with an automatic clutch. The serial number began CT90-1800008. 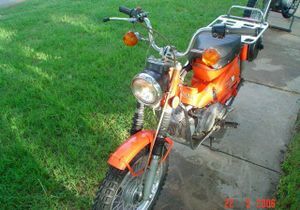 The Honda Trail 90 CT90'78 was sold 1978. One color was available: Bright Yellow. The frame shroud and side covers were the same as the body color. The "HONDA" decal on the shroud was white. 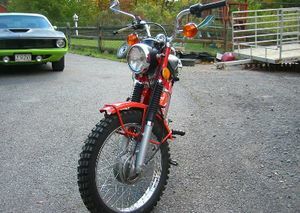 The handlebars had a swivel lock and were now black. Also the wheel hubs were black. The exhaust system was black and the heat shield were chrome. The seat was a solo seat with chrome rivets. The chrome luggage rack behind the seat was standard equipment. The turn signal housings were chrome. An auxiliary fuel tank was mounted on the left side of the rack. The rear shock springs were now black. 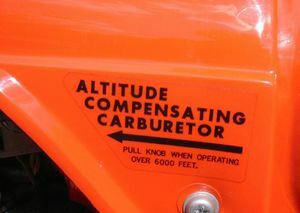 The transmission was an 8-speed dual range. The front suspension used telescopic fork tubes. 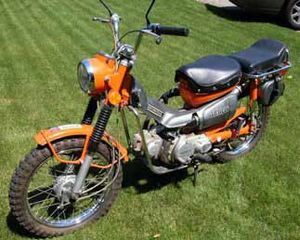 The engine was a 89cc OHC single cylinder with an automatic clutch. The serial number began CT90-1900010. 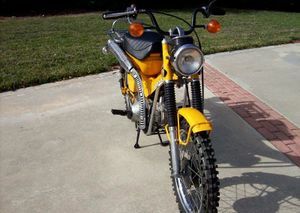 The Honda Trail 90 CT90'79 was sold 1979. One color was available: Tahitian Red. The frame shroud and side covers were the same as the body color. 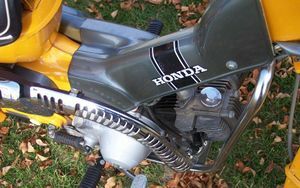 The "HONDA" decal on the shroud was still white, but much larger than the previous year. 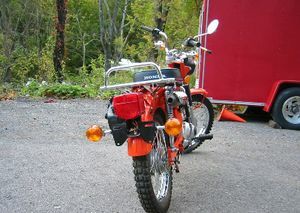 The handlebars had a swivel lock and were now black. Also the wheel hubs were black. The exhaust system was black and the heat shield were chrome. The seat was a solo seat with chrome rivets. 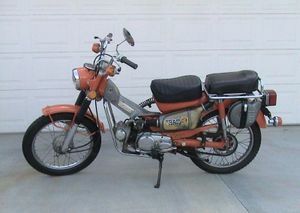 The chrome luggage rack behind the seat was standard equipment. 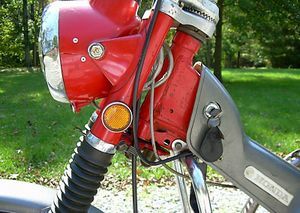 The turn signal housings were chrome. 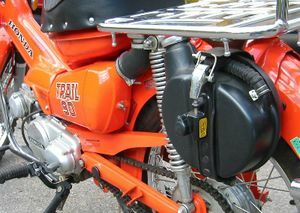 An auxiliary fuel tank was mounted on the left side of the rack. The rear shock springs were now black. The transmission was an 8-speed dual range. 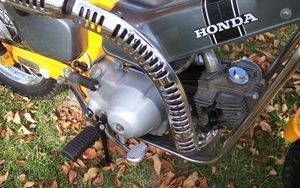 The front suspension used telescopic fork tubes. 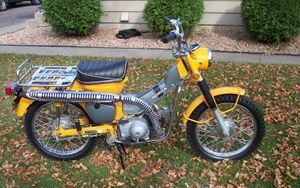 The engine was a 89cc OHC single cylinder with an automatic clutch. The serial number began CT90-5000011.